Peels are powerful skin treatments used to improve the tone, texture, and appearance of skin by removing damaged outer layers. Peels reveal new skin and boost collagen production to brighten and reduce the appearance of fine lines, and can assist in the control of acne. Peels are powerful skin treatments used to improve the tone, texture, and appearance of skin by removing the damaged outer layers while helping to build collagen and elastin. Peels can help even out skin pigmentation, reduce fine wrinkles, and control acne. The type of peel used depends on your skin and unique needs. Plum exclusively uses the Rhonda Allison Cosmeceuticals line of peels. Formulated using the science of chirality for optimum efficacy, Rhonda Allison skin peels feature only the purest, highest grade ingredients for maximum results. 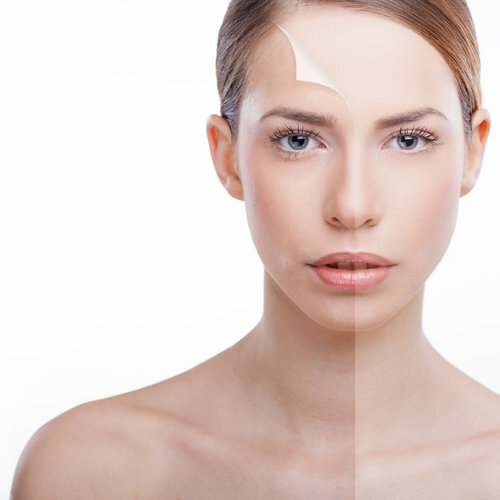 Typically, peels are performed Fall-Spring due to the chances of hyper-pigmentation with sun exposure. For an excellent exfoliation option during the late Spring and Summer months, consider Microdermabrasion. After a thorough skin analysis, a peel appropriate for your specific skin type and needs will be chosen. Plum offers Vitamin C, Fruit Acid, Lactic, Glycolic and Salicylic peels. Includes cleansing and moisture treatment. While a single peel provides excellent exfoliation to clean out pores and improve skin texture, a series of peels performed over several weeks will provide more noticeable results. A mid-depth peels require a initial consultation appointment and at least one week of preparation with an active cleanser or serum prescribed by your esthetician. Mid-depth peels are ideal for men and women with deeper hyperpigmentation, sun damage, acne scars and texture problems. These peels will usually provide light, yet notable peeling during the first week. Peeling varies from client to client, depending upon many factors. *Maintain and see results with multiple treatments! Save when you purchase a Treatment Series.